It has truly been a whirlwind couple of weeks from the start of CSM in Anaheim last week to returning to NYC yesterday. I feel like I have been away for a month because so much has happened! Not only did I attend CSM in Anaheim, but I also took a road trip with Dr. Sandy Hilton and Dr. Sarah Haag to the San Diego Pain Summit (more on that trip and the summit in another post). 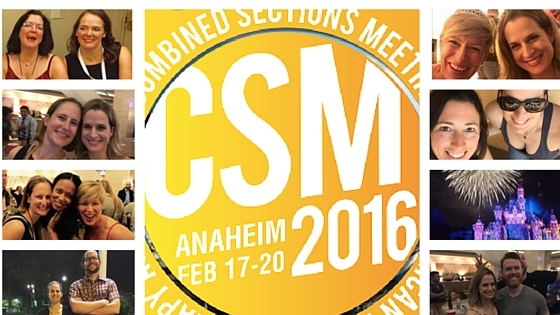 Here are my biggest take-a-ways from the CSM conference in Anaheim, CA. ** I am going to be a bit selfish here…one of my biggest highlights was the live podcast I did with Dr. Karim Khan and Dr. Jill Cook. It was pretty amazing to have two prominent researchers and clinicians sit down for very informal and intimate interviews. They were relaxed, funny and of course super informative. I learned more about tendinopathy in 25 minutes from Dr. Cook that I have the past 10 years! From Dr. Khan I learned that professions outside of physical therapy really do see the value we bring to this world. He illustrated how as a profession there are so many avenues we can take to make a huge impact on society. The audience was small and full of students and they all got to meet both Dr. Khan and Dr. Cook. Most of them said it was the highlight of their CSM experience. I want to thank the Private Practice Section of the APTA for all of their help in securing a room and getting the word out! Both of those interviews will be out this week! ** There were some great educational sessions this year! Of course it is impossible to go to all of them but I will recap some of the ones I attended. Thursday morning I was up bright an early to attend The Why, What, and How of Vital Signs and Cardiovascular Risk Stratification for the Outpatient PT with Dr. Matt Lee, Dr. Rich Severin and Dr. Kyle Ridgeway. The hashtag for this talk was #VitalsAreVital and that theme permeated throughout the talk. Because we are now a doctoring profession, we might be the entry point into the healthcare system for our patients. As a result we NEED to get baseline values, this means vital signs, on all of our patients…regardless of the rehab setting. There are no other healthcare professionals out there that do not take vital signs on the first visit. As a profession we need to be able to recognize that our patients (even in the outpatient setting) may have many risk factor for cardiovascular disease and we can address it. For those therapists working with a very healthy athletic population vitals are still vital when designing an endurance program…we must not forget that! Friday morning I attended The Customer Experience in Health Care: The Game Changer, Part 1 with Jerry Durham, PT and sponsored by the Section on Women’s Health. This was a patient panel that included two brave women who stood up in front of an audience and spoke their truth. They spoke about their experiences with the US healthcare system and with physical therapy in particular. Erin and Lisa, although having very different medical journeys, had very similar messages. The biggest message is that patients are people! You are not treating a knee or a pelvis or a CP patient. Instead you are treating a person with knee pain, pelvic pain or CP. That person is more than just a piece of meat and they deserve our attention, they deserve to be heard, and they deserve to be an active participant in their care. As therapists we need to be a true therapeutic partner and educator. We need to use our scientific and clinical knowledge and pair that with the patient’s values to create a rehab program that is both meaningful and evidenced based. Finally Saturday afternoon I attended Preoperative Neuroscience Education for Lumbar Radiculopathy with Dr. Adriaan Louw and Dr. Louie Puentedura. I could listen to them speak all day! In this session they spoke about the importance of preoperative neuroscience education as it relates to cost savings and patient attitudes towards their pain postoperatively. If you have not had the chance to hear either of them speak in person…make it happen! I can confidently say that I will be using what I learned in this session immediately in my practice. ** I took the advice of Ann Wendel, PT and networked every night…instead of going to be early. From PT Pub Night on the first night of the conference to connecting with old friends and meting new ones, the extra networking was definitely a good decision! At CSM the educational sessions are great but the conversations had behind the scene are just as valuable. From Free The Yoke convos with Mike Eisenhart, PT and Sturdy McKee, PT to cash PT talk with Sarah, Sandy, Paul Gough and Dr. Aaron Lebauer I would say CSM networking was a success! ** Finally, I have to give a huge shout out to the Section on Women’s Health. Their programming was outstanding this year and a huge reason for that is THE Dr. Sandy Hilton! She is forward thinking, collaborative and not afraid to think outside of the box (no pun intended). It is great see the buzz about the SOWH and the fact they are bringing the pelvic back! Because every patient has a pelvis and it does not have to be a scary or awkward conversation to have with your patient. My best advice for your post CSM world: follow up with your new connections, get all those new ideas and inspirations down on paper and then start working towards making them happen!